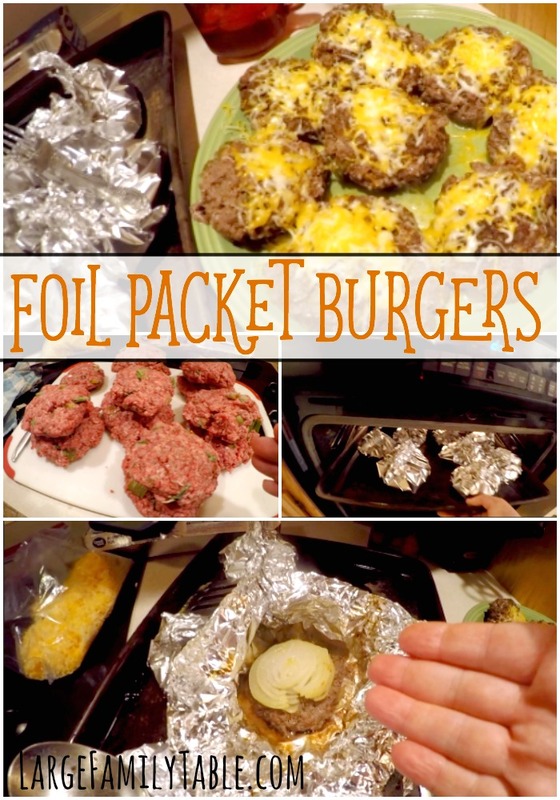 Foil Packet Burgers | Large Family Recipes! Burgers – as American as baseball and apple pie. Sometimes, nothing can beat a delicious, juicy burger right off of the grill. But what if you are currently “grill-less” like we are, but you’ve just got to have a burger? 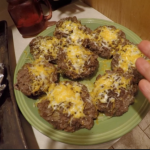 Obviously, you can cook burgers other ways besides on a grill, but what a mess! I got tired of cleaning up the greasy mess they left on my stove top; and the counter was a mess when I used my griddle. So I decided to try something a little bit different and make these burgers in foil packets and cook them in the oven. They turned out so yummy, and the kids loved having their own little packet! I added onions to the top of my husband’s burger, and I sprinkled shredded cheese on top of the rest of the burgers. Delicious burgers without the mess! Add spices to ground beef and mix thoroughly with your hands or a Kitchen Aid. Form meat into patties, and place each patty on a square of aluminum foil. Seal foil tightly. Place all packets on a baking sheet. Bake at 400* for one hour, or until done to your liking. Feel free to add whatever you like on your burger before cooking. Some yummy options would be cheese, mushrooms, green peppers, or onion slices. The thing I love about this recipe is how easy the clean up is! No nasty stove top to clean, and no greasy pans. I just gathered up the foil and threw it in the trash, and Voila! Clean up was done! We enjoyed these burgers with a simple salad of lettuce, tomatoes, and cucumbers. Because I am (mostly) attempting to do Trim Healthy Mama, I enjoy having my burger on my salad instead of on a bun. Do what works for you! Click here to watch the full foil packet burgers video! I hope you will try these easy burgers. Be sure to comment below and let me know how they turned out for you! Brilliant!! I just today did not buy hamburger because I didn’t want a mess and I am grilless, too! Way to go and love the channel! I’m trying these out tonight. Seems easy peasy, and I like easy peasy lol. Thanks for the great recipe! So love this post! There are days here when it is too windy to grill!!!! But this is a awesome substitution ???? 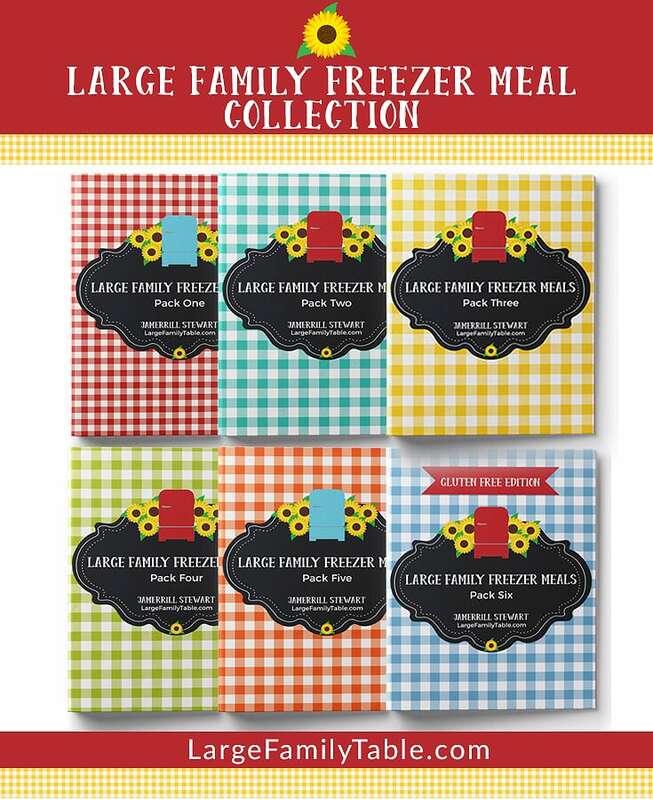 Have you pre made these and freezed them? I learned this method 40+ years ago in the Boy Scouts. We would prepare them ahead of a camping trip and freeze them. Then all we did was toss the foil packets on a campfire grate and boom. Supper was done. They come out really juicy and the onions are steamed just right. Delicious.